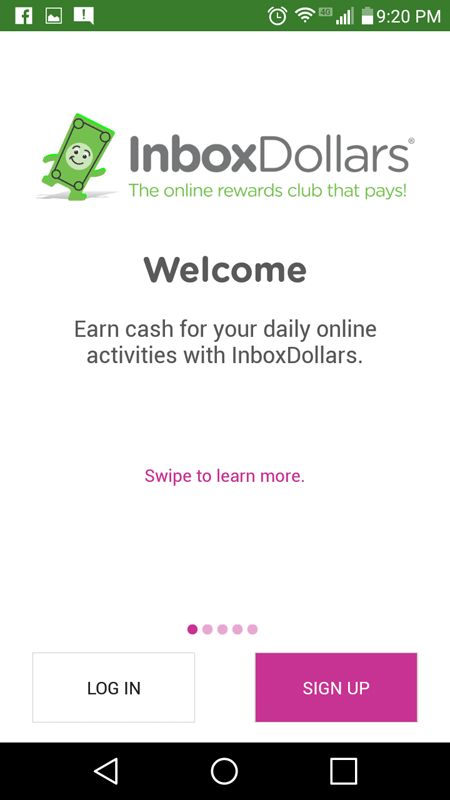 Can You Really Make Money With The InboxDollars App? 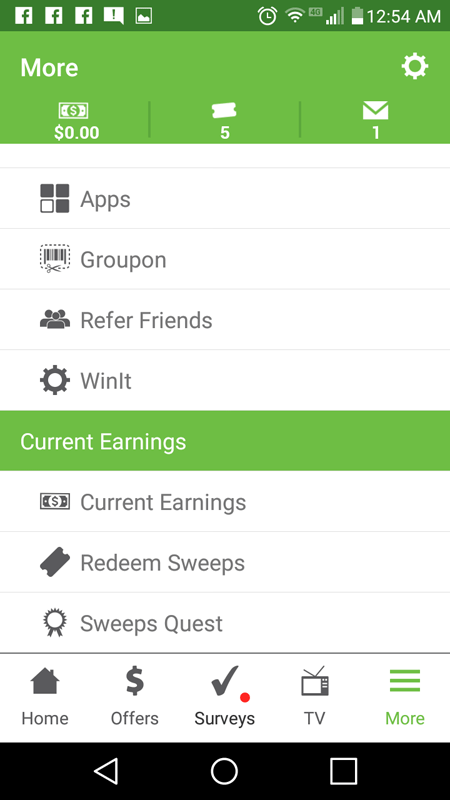 As you likely know, I spend a lot of time looking for apps that will help me to earn extra cash on the side. And that, in fact, is how I came to find InboxDollars. 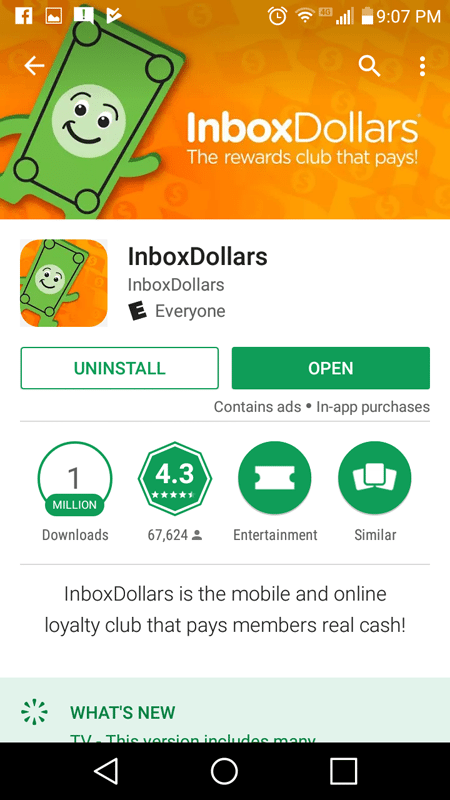 But can you really make money with the InboxDollars app? This is the question that is definitely the most important to me, as I put a lot of thought into my side-hustles. Nowadays, you really need to work hard to get by—and making some extra cash never hurts. I love the idea of earning extra money through apps, because pretty much everyone has a phone that they can make use of—but the problem is finding apps that are good enough to be worth the time. A lot of extra cash apps are a joke… but, there are some exceptions. And secondly, because of its Google Play rating. The app has been downloaded over 1 million times, and has a rating of 4.3 stars—which is pretty awesome. Oh, and I've already reviewed the desktop version of Inbox Dollars. I tend to find that apps with a rating of 3.5 stars or more are much more likely to get my attention. I also find that apps with more than 250,000 downloads are far more likely to strike my fancy than apps with fewer downloads… so on both of these requirements, InboxDollars was ahead of the game. But this only told me so much, so I decided to download it and try it for myself. Here’s what I found. 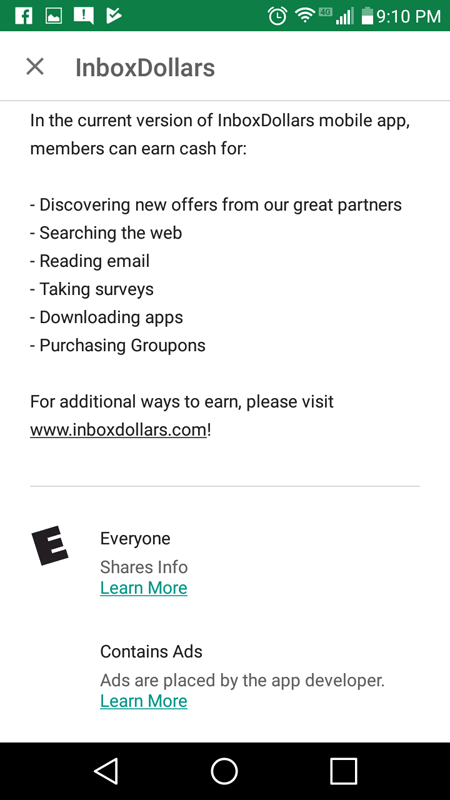 How Exactly Does InboxDollars Work? The first thing that I wanted to figure out was how the app is supposed to help you make extra money. So I visited the Read More section, and found this. This pretty much told me everything I needed to know about what type of app this was. This type of app is what I call an ‘Offers App,’ or an app that rewards you for completing offers. From the sound of it, this app provides a number of different types of offers to its users. But now, it was time to give it a try. After this, I clicked the ‘Sign Up’ button to get started. I was asked to enter an email address and to create a password—which I did. This ended up bringing me to what seemed to be the ‘main hub’ of the app. Here is what it looked like. Scrolling down, I immediately saw a lot of different offers that I could click on to take advantage of. These ranged in value from $0.15 to $5… depending on what they were and what was required to complete them. There were product trials, surveys, shopping cash-back deals, etc. Across the bottom of the screen were categories that you could click on. There was a Home button, as well as buttons for Surveys, Offers, TV, and More. Under the More section there were plenty of other things to look at as well. Here is a screen shot of most of the options in that menu. So far, the app had been pretty easy and straightforward to use. It responded well, loaded quickly, and performed pretty much as I expected it to. 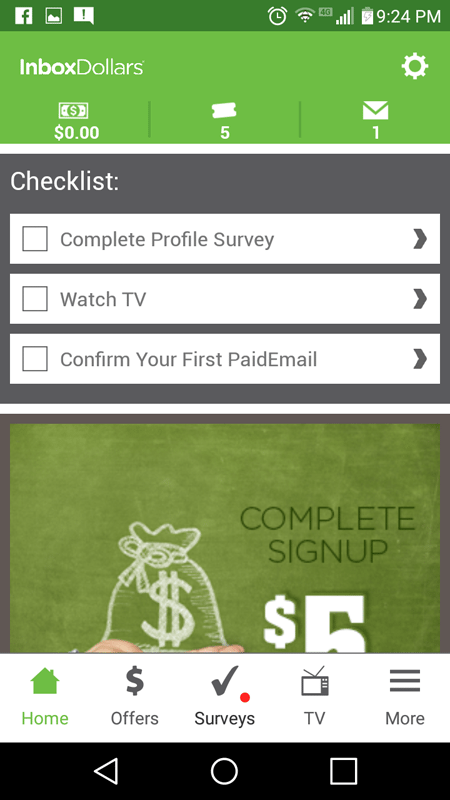 I was also happy to see that the app used real dollar amounts, instead of points that you would have to convert later. A lot of apps use points, I think because they make you feel like you are accomplishing and making more than you really are. So, call me weird—but when an app uses real dollar denominations, it just seems more genuine to me. But, at this point, I wanted to find out how easy it was to earn money. So I decided to find the easiest offer that I could find, and complete it. Ok. As it turns out, completing an offer in InboxDollars wasn’t necessarily a foolproof plan. First, I tried to take a survey. 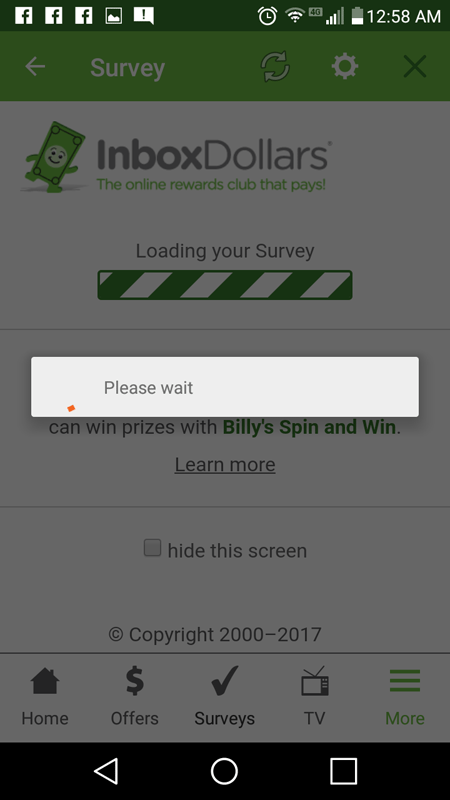 The survey asked me to answer a few basic questions about myself before I got started, which I did… but then, the app just booted me back to the previous screen, exiting out of the survey. I tried three times to load it, and each time I just got booted out—with no explanation of any kind. After this, I went to the TV section, thinking that I would, instead, watch a video to earn some money. I watched one segment of one of the ‘TV’ channels that they host on the app, which took about a minute or so. In doing so, I earned 5 ‘sweeps,’ which turned out to be these point type things that you need to enter the various types of sweepstakes offered on the app. You basically spend these to enter lottery-type games for cash, which seems a bit gimmicky to me. After the video was complete, I watched the same 20 second video ad four times in a row… and never got anything for it, which felt a bit unfair. I don’t know… I wasn’t very impressed with all of this up to this point. 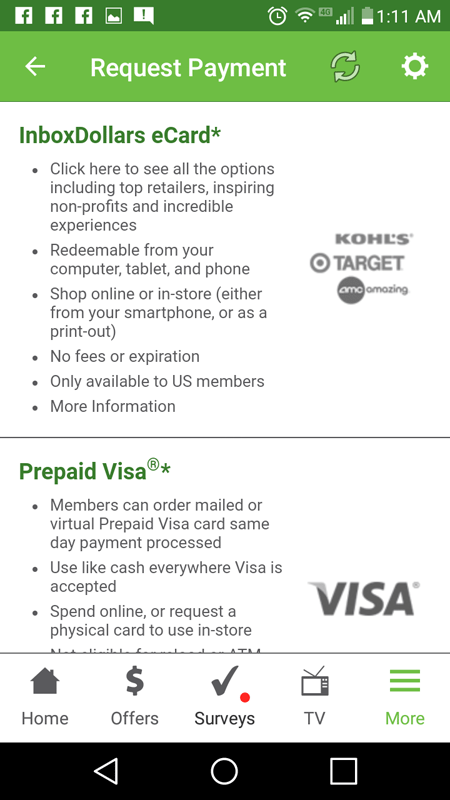 I could get a prepaid Visa card, a regular paper check (this was a bit old-fashioned… but hey, I’m not complaining), or an InboxDollars eCard. There were plenty of offers to earn cash with—but I will also say that most of them were of pretty little monetary value. There were a lot that were either $1 or a little more. This seemed to be the average, with plenty of other options that were less than a dollar. With all of this being said, I felt like I had figured out enough about the app at this point to make my final decision. But for me, making enough to make it worth the effort is super important. I feel like it could take me up to a month or more to reach the $30 payout with this app, which isn’t too bad in theory—but when you factor in how much time I would need to spend on it in order to get that done, it just seems like too much. I do like how the app looks. It’s pretty fun to use, for the most part—but maybe not fun enough that I would choose to use it over earning cash some other way. People who really like to fiddle on their phones might like it, because it can introduce you to a lot of new apps and show you some videos… some of which are cool, and some not so much. But yeah, I feel like I can find better ways to earn cash than with InboxDollars. It does work—but just not fast enough or well enough for my taste.